(Unlike most solar powered lights, this security light is exceptionally bright. I use two of these myself ( Front and the backyard), and I'm very impressed. 3)180 degree beam angle and 30 ft beam distance. 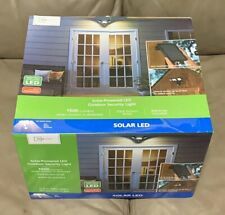 This for a lot of 2 Mainstays 1500L 3000k LED Solar 180 Degree beam Security LIght w/ Batteries. Condition is New. Brand New and never opened. In original retail packaging. Purchased from Walmart. Features: 1) Easy installation - no wiring required 2) Detects motion up to 12 ft 3) 180 degree beam angle and 30 ft beam distance 4) 1500 lumens, 3000k Warm white color temperature similar to old incandescent bulb light.